For several years now Blockstream and Core supporters have been advocating a “fee market” and having full blocks all the time. Many have even gone so far as to claim that Bitcoin is unstable without full blocks, while completely ignoring that the blocks were not full for the first 8 years of Bitcoin’s existence. As any Bitcoin user knows, the network is completely full now. Every business is spending countless hours dealing with customer support requests relating to transaction that haven’t confirmed. In the last year confirmation times have gone up from about 10 minutes, to nearly two hours! 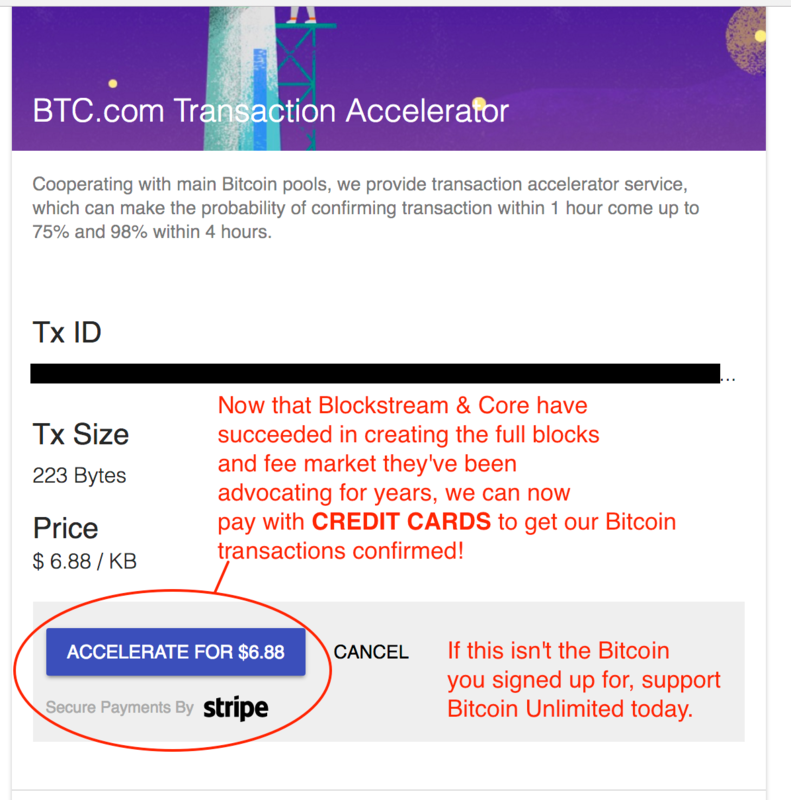 I was stunned earlier today when I came across a service that now allows people to pay with CREDIT CARDS to have their Bitcoin transaction confirmed! This certainly isn’t the bitcoin that I signed up for, and I think everyone should be shocked by how bad things have now gotten thanks to Core and Blockstream’s misguided economic policies. Segwit is not the answer. It is worth noting that this kind of fee market is exactly what the current Core team have been advocating for years. Now they have it, and it is a disaster just like myself, Gavin Andresen, and many others have been saying all along. The owners of Friendster, and then Myspace thought that it would be impossible for any other social network to supplant their position. Facebook proved them wrong. The current Core developers think that it is impossible for any currency to supplant Bitcoin, but if Bitcoin doesn’t grow and adapt to keep up with consumer demand, it will be replaced by something that does, and it will be the current Core developer’s fault for blocking every on chain scaling attempt and intentionally implementing disastrous economic policies. If you love Bitcoin and want to see it become a currency used all over the world, it is time to reject the insane economic policies of Blockstream and Core, and support Bitcoin Unlimited instead.